Deb's Cup of Tea: Pizza guy? Just toss it. The street is so close. After three days of shoveling, if I desperately needed something, it could be tossed to me and I could, in theory, catch it. I'm not real good at estimating distance, but after today's bit of shoveling, I probably have 20-25 feet left to get to the street. Where the plants are on the left is where the sidewalk is. I should be able to reach that in tomorrow morning's shoveling. Assuming I sleep as well tonight as I did last night, I'll be up for it. My afternoon shovel session was very productive. The shovel marks where I ended this morning. The snow here is a bit under knee deep. It's still a lot to move but the two shovel approach makes it some what easier. 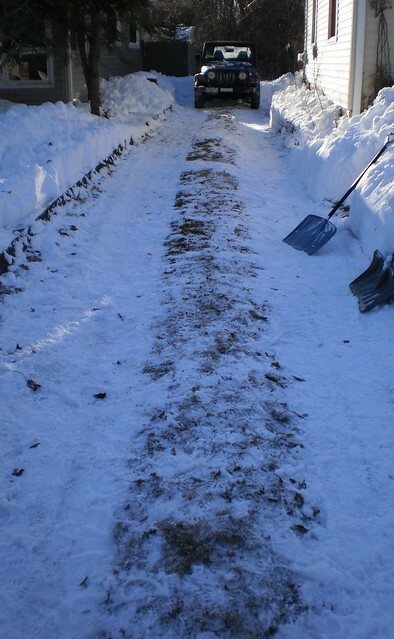 In theory, I wouldn't have to shovel as wide of a path as I am. That is, pretty much, the whole drive. But I have told myself that doing just the bare minimum will come back to bite me as this melts so I'm doing the whole drive. When I look back at the Jeep, I think that's a smart, if exhausting, thing to do. I moved the Jeep forward 2 feet, to get the tailpipe out of the snowbank behind it. 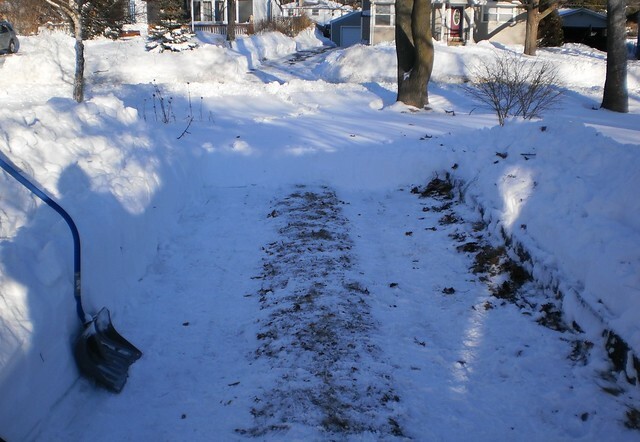 Next week, I'll shovel that area out a bit more. The Jeep started up just fine. No, I gave no thought to "gunning" it. I might be able to get a running start and to get out, but there is no way I'd get back in. I also gave some thought to knocking the snow off the south railing. I think I'm going to leave it, however. 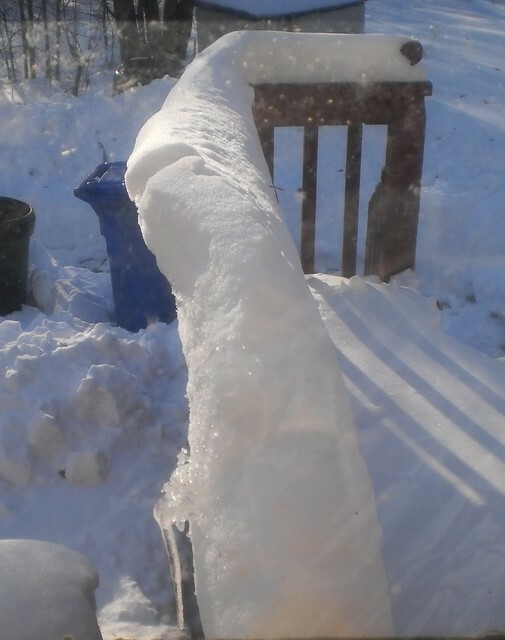 I want to see how long before it either melts completely or tips over. So day 4 ends. The sunshine of the last two days is supposed to be going away. It got windier this afternoon although it wasn't cold. Tomorrow is to be warmer still with clouds and snow showers. 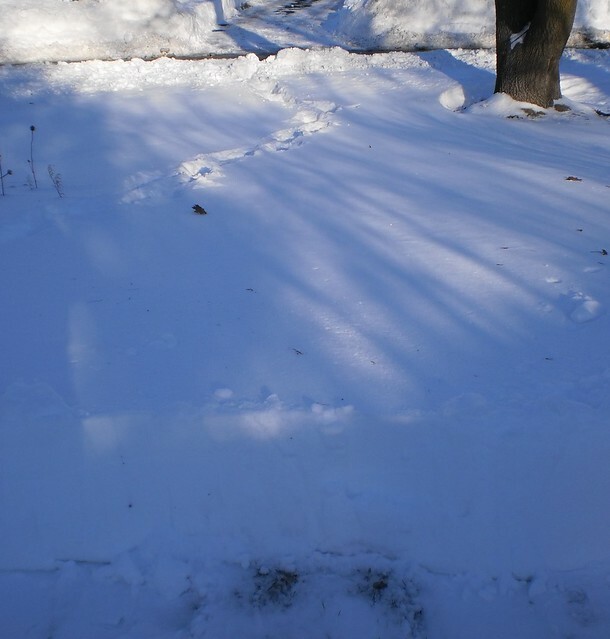 I realized, looking out the front door, that I could shovel off the top step and maybe one or two of the steps themselves before I get into the drift. But my main task is to get to the street. I can get out of my house if I had to, therefore, the front door can wait. I think hot cocoa with a shot of cinnamon schnapps is in order tonight.